After constantly being sent out of class for "bad behaviour", John Mclean left school at 14 years old. "I thought that I was just stupid because I couldn't learn and I couldn't read," he says. "I thought there was something wrong with me." 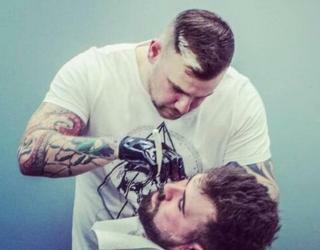 John, who now works as a barber in Montrose, went on to be named "Student of the Year" at Dundee and Angus College after receiving support for his diagnosis. He remembers feeling "shocked" when he found out that he had won the award. John says: "It was the first time I had ever won anything in education before - it was an achievement." Dyslexia is a learning "difference", which means that a person's brain approaches things in a different way. People with dyslexia can often experience problems with timekeeping, taking notes, remembering numbers, names and details. The charity, Dyslexia Scotland, says: "It is not just about reading and writing and it has nothing to do with intelligence." Dyslexia Awareness Week is taking place from 5-10 November, with the aim of making people more aware of dyslexia and giving teachers the knowledge to recognise and support those with dyslexia. When John was at school, he says he did not receive much support from his teachers. He remembers teachers often took no interest in him and treated him differently to other pupils. "Everyone just thought I was disruptive, because when I couldn't focus on something I would start fidgeting and get stressed out," he explains. Dyslexia Scotland states that "unidentified dyslexia can result in high stress, low self-esteem and low achievement". "Dyslexia can affect the way people communicate, and it is different for everyone," it says. Due to the varying nature of dyslexia, it can be difficult for teachers to recognise it in children, especially if they have not been trained in how to spot it. John's teachers did not recognise what was causing his high levels of stress. They would send him out of the classroom when he appeared to be misbehaving. He says nobody thought to test him for dyslexia. "I often just mucked about because I couldn't learn anything, which was due to all of the written work they gave us," he says. At 35, John discovered that he had dyslexia after a tutor at college recommended he take a test. "Finding out I had dyslexia was a relief," he recalls. After all those years, John says he finally realised he just processed information differently to other people. Despite experiencing varying levels of difficulty when learning new things, those with dyslexia are often very creative and skilled at completing practical tasks. John says he has always found practical work easy and that the only people at school who believed in him were his art teacher and his home economics teacher. "I've always been good with my hands. I worked as a chef before I became a barber. "I also taught myself to DJ when I was a teenager after watching someone DJ at a party, and I have been playing ever since," he adds. "That's how I learn - by copying others and then remembering how they did it." Dyslexia Scotland estimates that 1 in 10 people have dyslexia. Dyslexia is classed as a disability under the Equality Act and although there is no "cure", practical things can be done to help overcome some of the barriers it presents. Spotting it early is important, and with support those with dyslexia can find ways to learn which suit them better. Compared to when John was at school 20 years ago, teachers are now more equipped and prepared to deal with dyslexia and children are often better supported. Dyslexia Scotland's chief executive Cathy McGee said: "In Scotland there has been a lot of work involved in raising wider awareness and equipping teachers with the knowledge, skills and confidence to identify and support dyslexia in schools." "Teachers can complete online training modules, with some local councils now making these compulsory for all newly qualified teachers", she added. Events like Dyslexia Awareness Week also help "encourage young people to talk about their dyslexia and ask for support", she said. However, Dyslexia Scotland said teachers and schools still faced "huge challenges in supporting all pupils in the classroom". Ms McGee said cuts to classroom assistants and support-for-learning staff had put extra pressure on teachers and limited their time to take part in training and learning opportunities. She added: "We hear every day from parents and others calling our helpline who are experiencing delays, frustrations and barriers in their children's dyslexia being identified and supported. "Therefore, although we know that there is a lot of very good practice, there is still a very long way to go."